If you’ve read this blog for a while, you may remember the mold incident. If you haven’t heard the story, let me give you the short version. I always clean out my bottles after I empty them. Cleaning is good, but then I’d let them sit on the counter to try. That seems like a good idea, but the only problem is that not all of the water would evaporate from inside of the bottles. Two or three weeks later when I’d need those bottles for my next batch of homebrewed beer and there would be mold in them. Most of the time I caught the bottles that had mold, but a few slipped through the cracks. After that happened a couple of times, I knew it was time to get a bottle tree. Luckily, my awesome fiancee bought me one for Christmas last year. Bottle trees look a lot like something that I would’ve used during my formative college years as a Christmas tree. However, for homebrewers they’re a useful piece of equipment which is worth the $30 price tag. A bottle tree sits on your counter, table or where ever you want it. It has branches that stick out, that you can put your bottles on and they sit inverted, allowing the water to drain out of them. 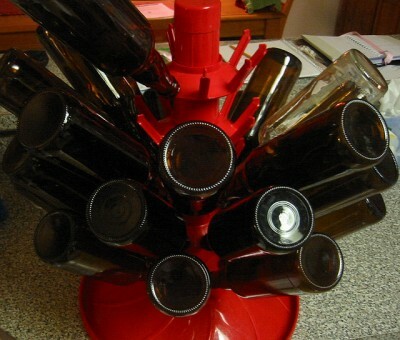 I use my bottle tree after I’ve cleaned out my beer bottles. I set them on the tree and let them drip dry. My old way was to dry them, then let them dry standing up on the counter. It worked okay, but sometimes there was still water in the bottom of the bottles. Even just a drop or two could turn into mold. When the bottles are dried inverted on the bottle tree, they dry completely with no water left behind. I also use my bottle tree on the day when I’m bottling my beer. When I’m sanitizing my bottles, I soak them in a bucket filled with hot water and sanitizer. I used to just set them on the table after that. Now, I set them on the bottle tree, where they can dry out and since they’re upside down, bad bacteria and evil yeasts will have a harder time getting into them. I have a bottle tree like this one from More Beer. (That link is my affiliate link to More Beer, purchase a bottle tree through that link and I’ll get a small commission that keeps Passion For The Pint running). However, you don’t have to get it from More Beer. Most homebrew shops online and off have bottle trees.